Stop thinking safe. Start thinking fresh. The Gravity Vault wants to take climbing gyms mainstream. Tim Walsh learned to love rock climbing in the Shawangunk Mountains, a bedrock ridge outside the town of New Paltz, 80 miles north of New York City. Lucas Kovalcik, his high school friend, developed his own passion for the sport indoors, as a grad school student at UCLA. When their paths met again at a friend’s birthday party, they hatched a plan to open a climbing gym. So they did. 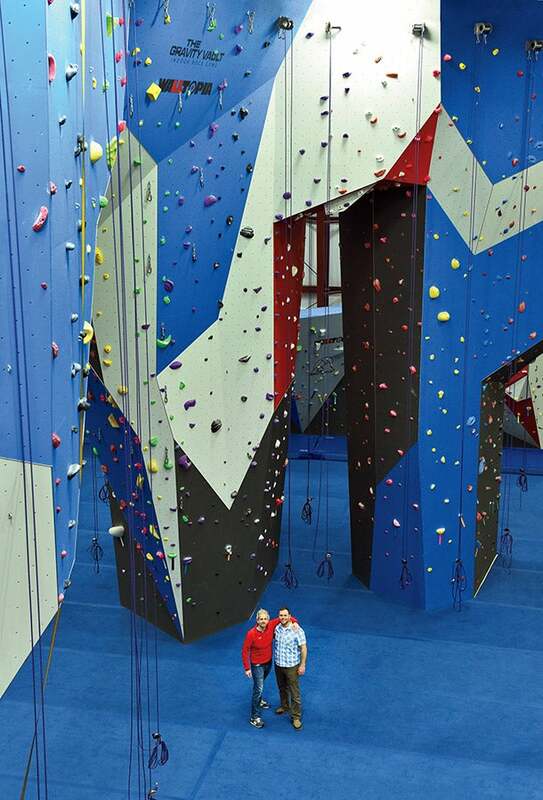 In 2005, they opened The Gravity Vault, an indoor rock gym, in Upper Saddle River, N.J. The timing was perfect: Climbing was catching on with the suburban set, powered by an under-the-­radar national craze. The number of climbing gyms in the U.S. has increased fivefold in the past two decades, to 450, and is still rising. And Walsh and Kovalcik have risen with it: In 2009, they opened a second Gravity Vault 40 miles south of the original. They were eager to keep expanding, but climbing gyms are expensive to open -- $875,000 to $1.7 million a pop. So, in 2013, they began franchising. Now they say they’ll have six to seven units -- three or four of them franchises -- open across the Northeast by the end of the year. A decade or two ago, people like Walsh and Kovalcik may never have gotten into the franchise game: The industry was known mostly for safe, common concepts like burger joints and oil change shops, and there was little room for out-of-the-box thinking. But that’s been changing as franchisors and brands are willing to take a chance on unique and innovative ideas -- whether they’re sports like climbing walls or once seemingly niche areas like life coaching, group therapy, paralysis recovery, mobile video gaming parlors and even dog hotels. The number of climbing gyms in the U.S. has increased fivefold in the past two decades, to 450, and is still rising. That’s exactly what Joe Whaley faced with his brand Chocolate Works. He had to distill a lifetime’s worth of chocolate know-how into a system so simple that even 5-year-old kids could be chocolatiers. Whaley grew up working at his parents’ chocolate shop in New York City and took it over in 1999. In 2008, the economy was tanking, and so were the corporate clients who bought most of his product. That led him to try some new ideas. The most successful: He added a retail shop and party space to his factory in Valley Stream, N.Y. “What we did was take the Hershey theme park and shrunk it down to fit in a retail store,” he says. At children’s birthday parties, kids can work the machines that cloak Oreos or marshmallows in chocolate, decorate their own creations and dip candy in a chocolate fountain. “The party piece revolutionized our business,” says Whaley. Two businessmen approached him about expanding this concept, so he licensed two locations in the surrounding area. Then, in 2012, he hired franchise attorneys and a consultant to get Chocolate Works ready for a bigger rollout -- and, he says, sold 35 units in 20 months, mostly in the Northeast. Now Whaley is ready to take his concept national, and has lined up an international candy distributor to get his chocolate and ingredients anywhere in the country. Comfort with change has been critical for franchisees of Montreal-based Spray-Net, which focuses on painting the kind of home surfaces that most people don’t consider “paintable” (like aluminum or vinyl siding and stucco). Using a proprietary spray system, technicians can adjust the paint’s consistency for heat and humidity on-site, ensuring the optimum drying time for the paint. While this core concept has not changed dramatically since it launched, the specifics have. “We’ve been franchising for two years, and our system has evolved tremendously,” says founder Carmelo Marsala. “We’ve developed custom software, figured out how to paint new surfaces and introduced a great training system.” And of course, those changes then have to be adopted by the franchisees -- meaning Marsala succeeds only if he picks franchisees who can evolve with the business. The numbers tell a good story: Since 2013, Spray-Net has opened 36 units in Canada. Another 14 are slated to open next year. The brand also has plans to move into the U.S. market. For many franchisors with nontraditional concepts, the U.S. market is the ultimate goal. But that doesn’t mean it’s the only path. It was actually the Chinese market that helped Michael and Babz Barnett. In 2004, they opened Romp n’ Roll stateside, in Virginia. Their concept is like a club with varied programs -- art, dance, music and play -- for children up to the age of 5. It proved so popular, they opened a second unit 10 months later and began to franchise in 2008. When the U.S. recession hit, they pulled back and wound up franchising with a company in China instead. They opened 85 units there between 2010 and 2015.